The easiest way to get the benefits of fresh pineapple is to slice it and then cut it into pineapple chunks. This can provide you with a tasty snack that is full of nutrients and antioxidants. Or, you can extract pineapple juice and drink the juice fresh. Some people like adding crushed pineapple or pineapple portions to their favorite healthy detox smoothie. Crushed pineapple can also add a delicious sweet flavor to plain yogurt, cakes, ice cream, or other desserts. You can also get much of the goodness of pineapple from canned pineapple. However, you should be careful about the sugar content, as sugar is often added to the pineapple juice. Manufacturers usually use the pineapple stem to extract bromelain to produce supplements. Pineapple is rich in many nutrients that are essential for a healthy diet. Pineapple is low in calories (50 calories in 100 g) but high in fiber and vitamins. In addition to these vitamins and minerals, pineapple also contains traces of B-group vitamins, vitamins A and K, copper, zinc, phosphorus, and iron. Considering the fact that pineapple is packed full of vitamins and antioxidants, pineapple is a very healthy fruit. 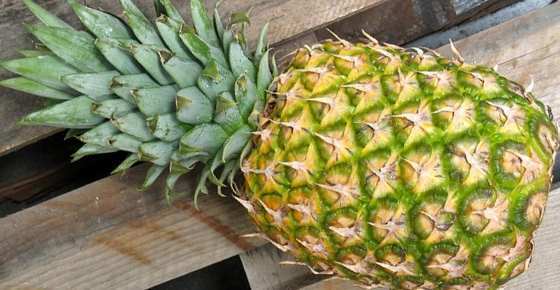 Researchers say that it is possible to extract bromelain from each part of the pineapple plant. (5) Of course, the amount of bromelain in fresh pineapple is less than what bromelain supplements contain. Bromelain is also used as a meat tenderizer and is often an ingredient in marinades. One of the advantages of consuming fresh pineapple or freshly squeezed pineapple juice is its nutritional value. Fresh pineapple contains a lot of vitamin C, fiber, and other goodness that you can’t get in a supplement. Let’s look in more detail at the tremendous health benefits you can get from fresh pineapple. One of the principle reasons you may want to consume more fresh pineapple is because it boosts digestive health. At the end of the article you can find how to make delicious digestive detox smoothie with pineapple. There is some evidence to suggest that consuming fresh pineapple can also improve your digestive health. There are also delicious herbal teas that can improve your digestion. Pineapples and pineapple extract can help to reduce inflammation in your body. Pineapple contains high levels of vitamin C that can help to keep your immune system healthy. For example, a glass of pineapple juice contains more than 40% of your vitamin C needs for the day. However, scientific research has shown that it’s not just the number of vitamins in pineapple that strengthen your immune system. Eating canned or fresh pineapple can also make you less susceptible to infection. Learn about other ways to give your immune system a boost using natural ingredients. Another reason why fresh pineapple is good for you is that it is full of disease-fighting antioxidants. Pineapples are just one of the many natural antioxidants that can improve your health. The anti-inflammatory effect of pineapples can help relieve the pain and discomfort of osteoarthritis. Although it may not be possible to eat enough pineapples to get its anti-inflammatory benefits for osteoarthritis, bromelain supplements can help relieve joint pain. Other studies on humans have shown that taking 400 mg per day of bromelain can help relieve pain associated with knee osteoarthritis. There are many other foods that help reduce inflammation if you have arthritis. The rich content of antioxidants in pineapples can help protect your eyesight from macular degeneration – a severe form of vision loss. One cup of pineapple chunks contains over 130% of your vitamin C daily requirements. Pineapple also contains beta-carotene and vitamin A – all of which are associated with good eyesight. Find out which other foods can help to improve your eyesight. Regularly consuming fresh fruits and vegetables is associated with good cardiovascular health. The fact that pineapple is rich in bromelain means that it is an excellent tropical fruit to boost your heart health. Find out how to improve your blood circulation to help keep your cardiovascular system working properly. Pineapple contains many compounds and antioxidants that could be effective in cancer therapy. Very often, cancer is linked to the effects of chronic inflammation and oxidative stress. Of course, it is important to remember that the anticancer effect of pineapple extracts have only been proven in the lab. More research has to be done to see how these results could be effective in treating cancer in humans. Drinking a glass of fresh pineapple juice per day or eating a cup of pineapple chunks could help prevent kidney stones. Also find out how to use apple cider vinegar to dissolve kidney stones naturally. The beneficial effect of fresh pineapple on lowering uric acid may mean that it is an excellent fruit to eat if you have gout. In fact, scientific research has suggested that ancient treatments for gout may be in harmony with modern medicine. For example, foods high in bromelain can help to treat the underlying cause of gout. (26) And indeed pineapple is one of the best foods mentioned in my article about natural treatments for gout. In 2010, a group of Indian scientists looked into different treatments for tuberculosis. They discovered that a mixture of pineapple juice, raw honey, pepper and salt helped to dissolve the mucus in the patient’s lungs. Mix all the ingredients and drink two to three times a day. Now you have your own cough remedy with no toxic chemicals added. 1. Look for pineapples that are heavy for their size and have dark green leaves, and eat them within 2-3 days for best results. 2. Choose Pineapples that don’t have soft spots, wrinkled skin and bruises which may indicate that the pineapple is past its prime. 3. For the most antioxidants, choose fully ripened pineapple (pineapple stops ripening as soon as it is picked). A sweet scent is generally considered the most important aspect of choosing a ripe pineapple. 4. A whole pineapple can be left at room temperature for one or two days before serving. After two days, if you are still not ready to eat it, you should store it in the refrigerator where it will keep longer (a whole pineapple can last up to 2 weeks, and a cut pineapple will last for up to one week). 5. Once you cut the pineapple, you should store it in the refrigerator in an airtight container. 6. Although pineapple can be frozen for up to 6 months, this process greatly affects its flavor. This is one of my favorite detox smoothies that has many health benefits. This detox smoothie consists of pineapple and papaya which contain digestive enzymes that help to improve digestion. Papaya enzymes are called papain and are extracted from the leaves and fruit of the papaya plant. The papain also acts as a diuretic, and has anti-microbial and anti-ulcerative properties. As such, papaya enzymes are believed to help relieve a variety of gastrointestinal complaints, as well as stomach ulcers. These are added to the bromelain in pineapple for added benefits. Put all the ingredients in a blender and whiz until smooth. You can add a little bit of water if you want a thinner consistency. Enjoy this detox smoothie after any meal to help your digestive system to do its important role. Pineapple juice has high sugar content as there are 10 g of sugars in 100 g of pineapple. Pineapples also have a medium glycemic index, so be aware of it if you are diabetic or pre-diabetic. Pineapple fruit may not contain enough therapeutic doses of bromelain for certain conditions. If you consider taking bromelain supplement consult with your physician first, as supplements may have side effects or interact with medications. Bromelain is available in tablet or capsule form for use by mouth. We thank u for ur wonderful information on health benefit of pineapple and its medicine. If it is inflamed it block the normal circulation of oxygenated blood to the tissues, that’s why there is pain, sliding massage can help break the inflammation for a fresh supply of oxygenated to the parts and our bodies capacity to heal by itself kicks in according to Manual of Surgery. Yes . . Apparently Bromelain arrests cancer cells. It helps with inflammation after an accident. Thanks for all the knowledge that I gain in your article.It helps me so much in my daily life n in choosing my food to gain more a healthy lifestyle. BUT U have to eat the core.. which most people throw away!!!!!!! that is the HEALTHIEST part!!!!!! Its just a little tougher but still yummy! My mother is diabetic. Is the pineapple can help my mother to reduce the Sugar on her body??? Pineapple was discovered by Christopher Colombus?? So, none of the indigenous communities noticed it before Colombus? Pineapple is a delicious fruit with good flour and contains useful vitamins especially Vitamin C which helps you to get rid of Cold. Regular use of Pineapple would help us a lot to keep good health. How does canned pineapple stack up against fresh? Is it good for you? Hi Pam, I believe these articles will answer your question. The first one – Is Canned Fruit Good for You? – talks generally about canned fruits, whereas the second one – Are Pineapple Chunks Healthy? – talks specifically about pineapples. Would of this fruit help my friend with fiber mycologists? I don’t have knowledge about it. I read on QUARA web page. That pineaple leaves reduces enlarged prostate gland size.